Is marketing ready for flat social media usage? Social media research shows the free lunch is over. Understand how social media marketing matured. Use these 10 social media marketing tactics to adapt your business to the new normal. 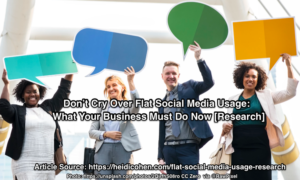 The post Flat Social Media Usage: What Your Business Must Do Now [Research] appeared first on Heidi Cohen.